Every spring in Antarctica brings conditions that favor the creation of the ozone hole. Scientists recently reported that this year’s hole maxed out in September, and while it’s smaller than in recent years, it’s too early to call it a recovery. A graph showing ozone levels each spring since 2006 and averages from 2001-2005. This year's levels are in red and connected by a line. The World Meteorological Organization said this year’s ozone hole measured around 8 million square miles. That made it smaller than last year’s and well below the record largest hole set in 2006, which reached across 10 million square miles. For comparison, the U.S. spans 3.5 million square miles. The ozone hole is due in part to human emissions of chlorofluorocarbons (CFCs), which were mostly used as a refrigerant. CFCs and other ozone-depleting chemicals have been largely phased out of use following the 1987 Montreal Protocol, but their effects are likely to linger in the ozone until 2050. “We cannot say that this represents recovery, but it is certainly good news to see this year on the higher side of the average ozone range,” Bryan Johnson, a scientist at the Earth System Research Laboratory in Boulder, Colo., said in a press release. The ozone offers critical protection from harmful ultraviolet rays, which can cause cancer in humans. 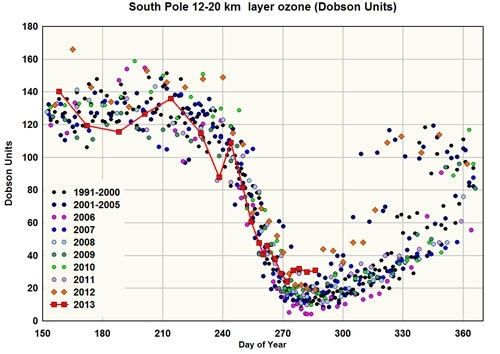 Researchers use a combination of satellite data, weather balloons, and ground observations to measure the ozone hole each year. 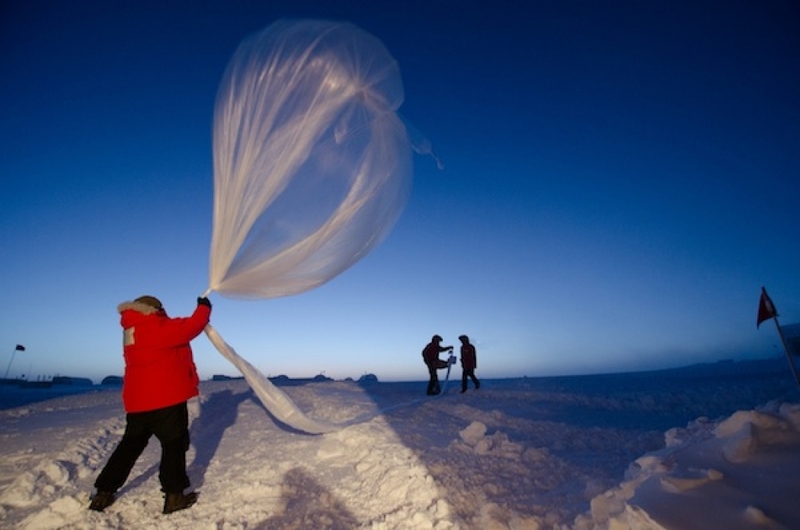 Irina Petropavlovskikh, an ozone researcher at the Cooperative Institute for Research in Environmental Sciences in Boulder, Colo., was part of the group using weather balloons, which ascend up to 20 miles into the stratosphere to measure the vertical extent and shape of the ozone hole and temperatures. An animation showing the ozone hole in four different years. Cold temperatures are a key ingredient in ozone hole formation. Long, dark winter nights coupled with winds whipping around Antarctica known as the polar vortex help stratospheric clouds form. Those clouds, in addition to being psychedelic, interact with the sun at the start of spring in Antarctica to allow chemical reactions to take place that can deplete the ozone. The stronger the vortex and more widespread the cold, generally the larger the ozone hole. As spring continues, the stratosphere warms enough that the clouds dissipate and the hole starts to close. NOAA staff release a high-altitude balloon in Antarctica, which carries ozone-measurement equipment up to 20 miles high in the atmosphere. The ozone hole could be having an impact on the growing extent of Antarctic sea ice. However, though it’s a phenomenon that occurs in spring in the Antarctic, the ozone hole’s effects spread well beyond the region and season. Gonzalez’s research shows that the ozone hole has played a big role in that by allowing the tropical jet to dip further south and steer more storms over the region during the summer months. The ozone hole has possibly had a bigger impact on precipitation in the region than greenhouse gases. Ozone recovery likely means drier conditions are ahead for the region, though Gonzalez said increasing greenhouse gas emissions could ultimately “win” over ozone recovery in terms of determining the region’s future.